1.2 What are the circumstances in Which Duas are accepted? Dua, otherwise known as supplication or a prayer is the process of undeviating communication between a person and his Lord. When you sit to make dua, you reveal to Allah (swt) your most intimate feelings and desires. You ask Allah for forgiveness, you plead for your aspirations and needs to be fulfilled. Dua is a safe haven for you when you have nowhere else to go. It is a place of solace for the grieving soul. You can pour your heart out to the Almighty when everyone around you has tired of listening. Allah never stops listening to you. He is there all the time watching over you and listening to your problems, your every pain and guiding you even when you may feel that he is not. Dua is powerful – it is inspiration for those that have lost all hope. You express your loneliness, your weaknesses, your mistakes before Allah (swt) and he listens and he forgives and he helps you when you least expect it. “and your Lord says call on me. I will answer you [i.e. your prayer]. Surely those who are too proud to serve Me will enter Hell” (Quran 40:40) (Tirmidhi). Have Wadu – it is good to be in a state of purity in body and clothes before you make dua, obviously if you are in dire need and do not have the provision to be in a state of purity then this is a different matter and Allah (swt) knows best, however in most cases where water is available Wadu is a must. Ideally pray 2 rakat Salat-al-Haja – it has been recommended to perform 2 rakats when one is in need or in difficulty. Prophet Muhammad (saw) said “Whoever is in need of something, should make a perfect abulation [By observing all its rules and etiquette] and perform two rakats of prayer. After it, he should praise Allah, send blessings on his Messenger (saw) and then recite the following dua. be sincere in what you ask for – Do not just ask for the sake of asking, Allah can see how sincere you are being in your duas. Do try and recite duas from authentic hadiths as the Prophet Muhammad (saw) covered all aspects of human need for which he had made dua. Here is a list of duas. Do make dua for yourself, your parents and for the whole of the Ummah. 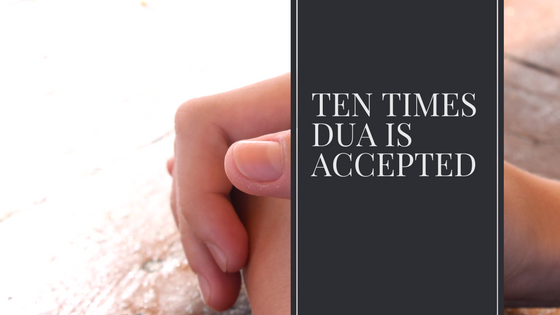 What are the circumstances in Which Duas are accepted? Fard prayer – There is no particular time when dua should be offered, rather there are several points at which it should be offered. It is best to use the duas recommended by Prophet Muhammad (saw). If you are unable to use these duas, you should always make your duas with sincerity and avoid fancy language or using a sing-song voice. Always ensure that you praise Allah, send salutations to the Prophet Muhammad (saw) and ask for forgiveness by saying Astghfir Allah. Between Adhan and Qiyam – It is encouraged to make dua at this time as it is one of the preferred times to make dua. Prophet (Saw) highly recommended tahajud prayer and said “Make a habit of observing Tahajud prayer. It was the custom of the pious before you. It draws you close to you Lord, and keeps you away from sins” (Al-Tirmidhi). Zam Zam Water – When you drink Zam Zam water you may ask Allah (SWT) for anything you like to gain or benefit from this water such as healing from illness or any other dua you want to make. “Jaber (RA) narrated that Allah’s Messenger (SAW) said: ‘Zam Zam water is for what it is drunk for” [Ahmad]. Jihad -When the Muslim is facing the enemy in battle, at this critical period, the du’a of a worshipper is accepted.